Bryan Adams plays during the second intermission at the NHL hockey 100 Classic in Ottawa, Dec. 16, 2017. Waterfront Concerts announced two new concerts Monday for the 2019 season at the Darling’s Waterfront Pavilion, both set for August. 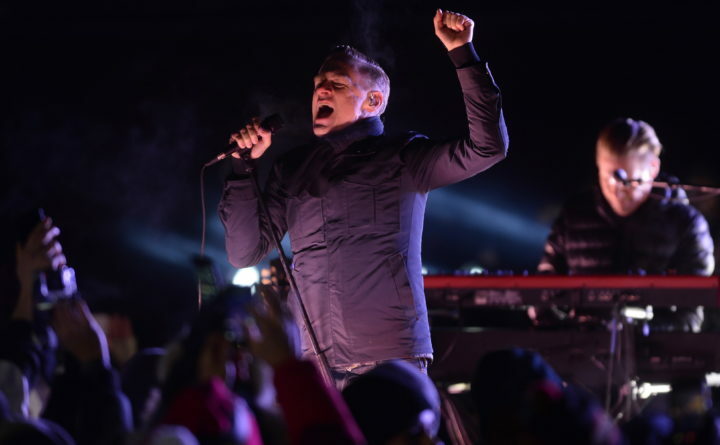 Bryan Adams will make his second appearance in Bangor on Friday, Aug. 2, while country singer Brantley Gilbert will make his second appearance in Bangor on Thursday, Aug. 22. Both concerts go on sale via Ticketmaster on Friday. Bryan Adams last appeared in Bangor at the Darling’s Waterfront Pavilion in 2016, where he played a two-hour set packed with his many hits over the past three decades, including “Cuts Like A Knife,” “Summer of ‘69” and “Run To You.” Adams last month released his new album, “Shine a Light,” co-written with pop star Ed Sheeran. Tickets for his August 2019 concert start at $25. Brantley Gilbert played in Bangor for the first time in 2014 at the Cross Insurance Center. He has recorded such country radio hits as “Bottoms Up,” “You Don’t Know Her Like I Do,” “Country Must Be Country Wide” and “One Hell of An Amen,” and a new album is expected later this year. Joining Gilbert on his tour will be Michael Ray and Lindsay Ell. Tickets for his upcoming Bangor concert start at $29.75. Monday’s concert announcements bring the total number of concerts on the Bangor Waterfront this summer to 15, after Ozzy Osbourne announced he was postponing his entire summer 2019 tour to 2020 due to health issues. For more information, visit waterfrontconcerts.com.